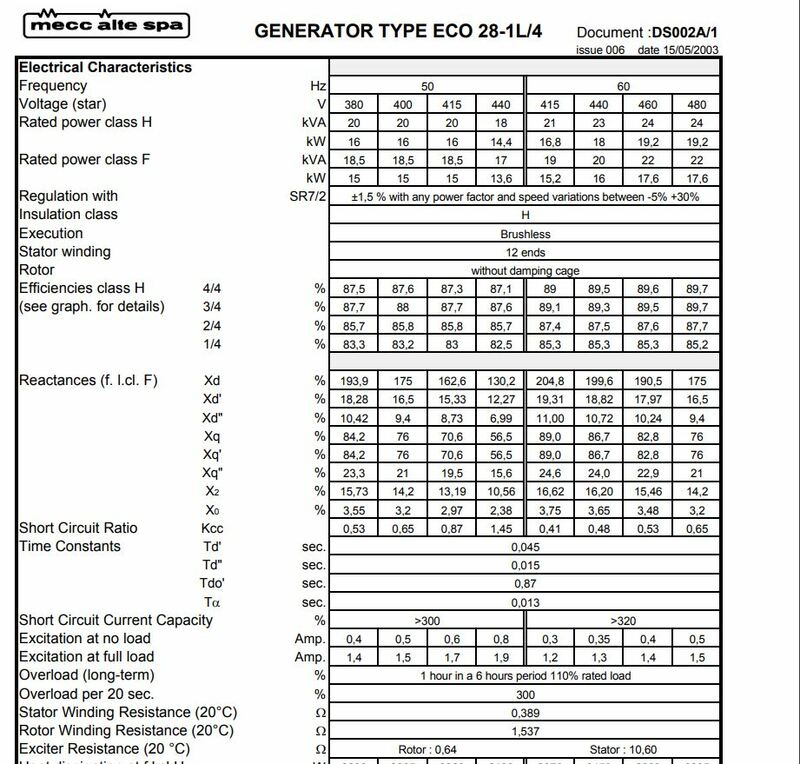 Hello, I have a 15KW Mecc alte generator with very little usage. My problem it only outputs about 27.5 volts on each leg and total of 55 volts. I have changed the AVR and it made no difference. Engine an Isuzu is running great. What is the problem and what are the procedures to check. Thanks in advance. Nobody out there have a clue as to what my problem is? Appreciate the reply: I have tried the flash as explained below, I do not see any brushes, here is where I stand and what I have done:Generator is MeCC alte spa Type ECO 28-1L/4 Model XM1622000N (see photo of Data). Purchased new in 2005 only has 45 hrs on it. Went to run it for test and had no power. Checked voltage with meter and was around 26 volts each leg. Removed cover to check things seen no issues. Ran fine and worked fine last time tested it about a month ago. From what I have read and understand sounded like the Voltage regulator (AVR) was bad. Ordered new one and installed made no difference same issue very low voltage. Tried flashing using drill in reverse made no difference. Went thru all wiring on top seen no issues so did more research. Decided to excite with 12 volt battery. This produced about 155 volts on each leg total output of 310 volts. 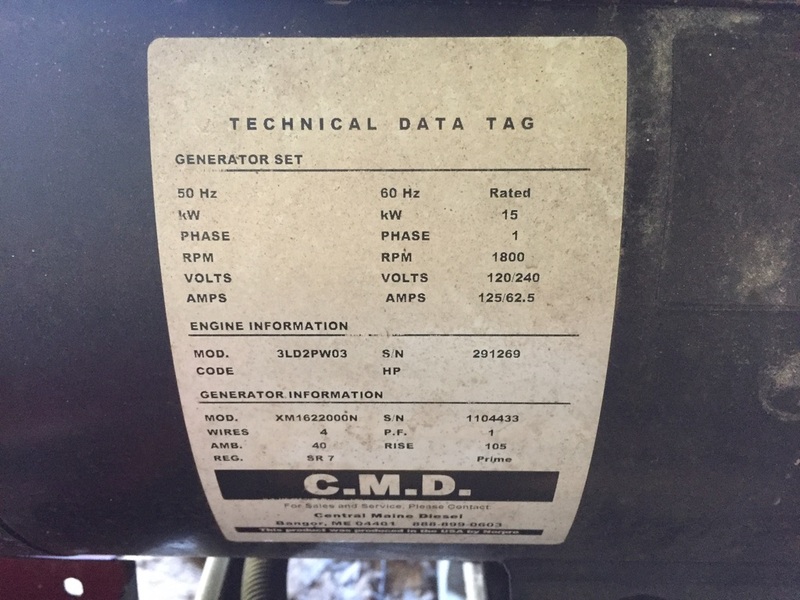 Turned generator off reconnected yellow & blue leads to AVR and tested voltage total output about 28 volts, ran engine for while to see if any change and was not. I can test do what needs to be if have instructions. So the problem is very low voltage and the question is what is the problem and what do I test/repair next. I believe I have answered everything. I see that it came from Central Maine Diesel. Have you consulted with them on it? Last edited by tabora; 03-31-2019 at 12:04 PM. I have the manual and it is tough going. Maine Diesel seems to only sale and not work on, contacted them on previous issue and sales seems to be the way. It's the 2nd new AVR. 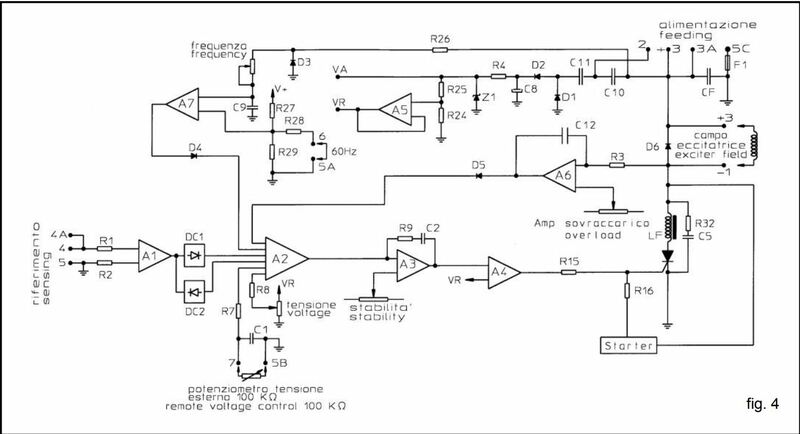 From what I can tell the AVR is not receiving correct voltage. With generator running and all connected terminal 1 & 3 shows only like 4 volts, shouldn't it be 110? So why would it not have any higher voltage. I tried all the adjustments with the voltage,Hz etc and made no differences after install of AVR. Does this mean internal issue? If was internal I don't understand why the voltages are fine when I excite with 12 volts. Also don't understand why I don't have more replies especially with information I have disclosed. I thank you for your assistance. If it's an SR7, have you performed the Test Procedures in section 1.3? What excitation voltage are you seeing on connectors 1 & 3? Have you contacted Mecc Alte directly for service locations or troubleshooting assistance? Last edited by tabora; 03-31-2019 at 12:21 PM. I'm assuming the AVR is the SR7. Check the winding connected to terminals 3A and 5C and the voltage disconnected from the board and connected to the board.. I think the voltage should be DC. I think this winding supplies the DC voltage to the AVR and exciter winding. The exciter winding and terminals should have DC voltage. 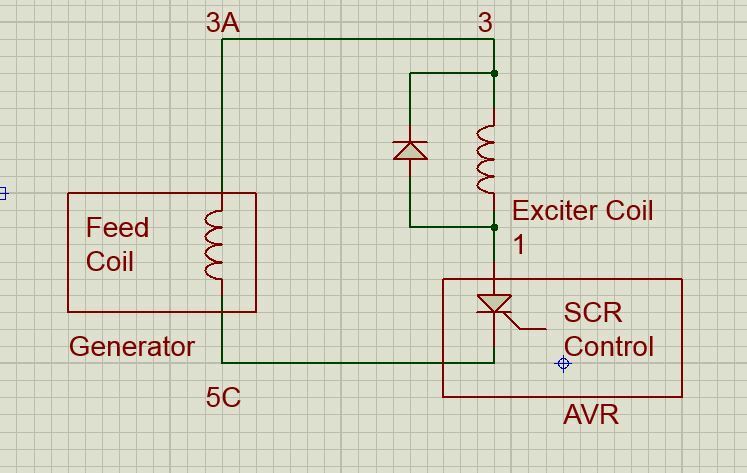 The AVR adjusts the voltage to the exciter winding to keep the AC output constant. The AC output is monitored on terminals 4A and 5. Maybe the winding at terminals 3A and 5C needs flashed or maybe a bad diode? The reason you had full output was because you put 12v DC on the exciter winding and this made the output go high. 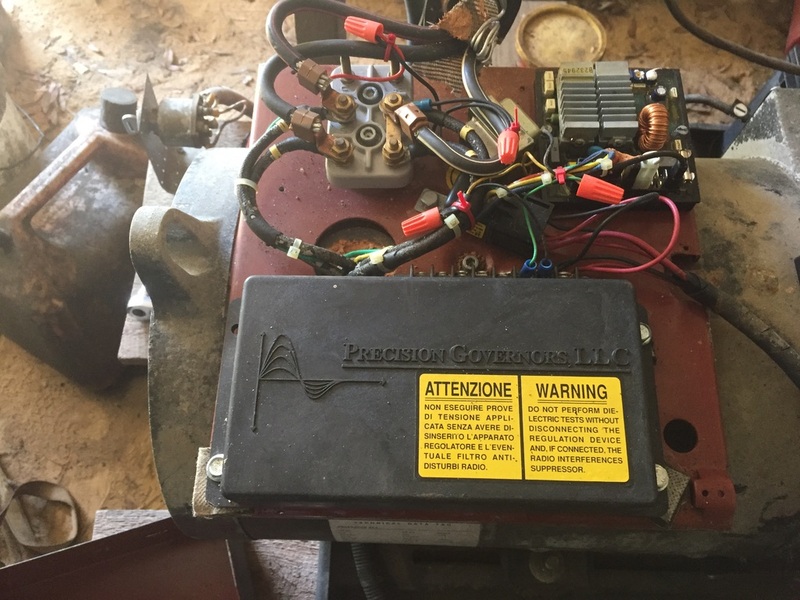 This says the exciter winding is good and the generator will produce voltage. I would like to add some information to the Madman75 note. Along with the stator's power windings there is an extra coil, which produces electric energy to feed the exciter field through the 3A and 5C terminals (see the attached simplified diagram). 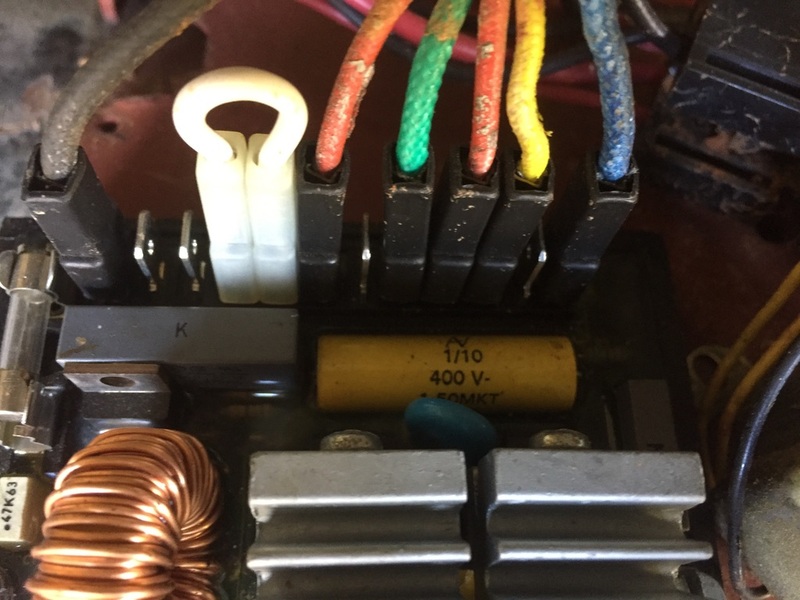 This is an AC voltage coming from the stator, may be between 12 to 24 volts. I assume this because in the generator specs, the excitation current varies between 0.3 to 1.5 Amp (0 to 100% load) and the exciter coil resistance is 10 Ohms so the DC effective voltage should be (I x R) between 3 to 15 VDC. This coil is fed from the feed coil to the exciter coil through a silicon controlled rectifier (SCR) which permits to pass the current flow in one direction when its control fires the SCR, in the other half of the AC wave the SCR always blocks the current. In parallel with the exciter coil there is a diode to protect from overvoltages due to the fast SCR commutation. As yotabota1 has tested, applying 12 VDC to the exciter coil, the generator produces an uncontrolled voltage, but everything is working correctly, If the AVR has been changed, then it seems to be a lack of voltage sent from the stator by the feed coil. Please check resistance between cables attached to 3A and 5C (diconnected from AVR), may be less than 10 Ohms. If not (infinite resistance), check cables , if they are OK suspect of an open feed coil which means a stator chancge or repair. Just another point to be considered: The need to "flash" the unit. 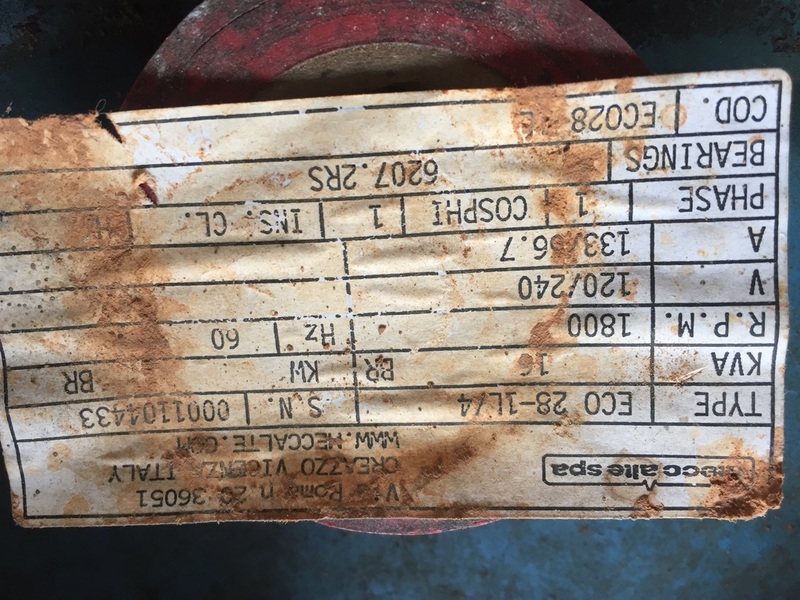 Sometimes, when a generator has been in inactivity, the residual magnetism in the rotor is too weak to generate enough voltage in the stator windings to initiate a closed loop and reach the operating levels of magnetism necessary to maintain the nominal output voltage level. In this case, exactly, the reported problem is a low output voltage (55 VAC). This voltage, in absence of an excitation current is due purely to the magnetic remanent field, which in normal conditions, would feed the exciter field, increasing the voltage generated, increasing the exciter field and so on. This is a brushless generator. 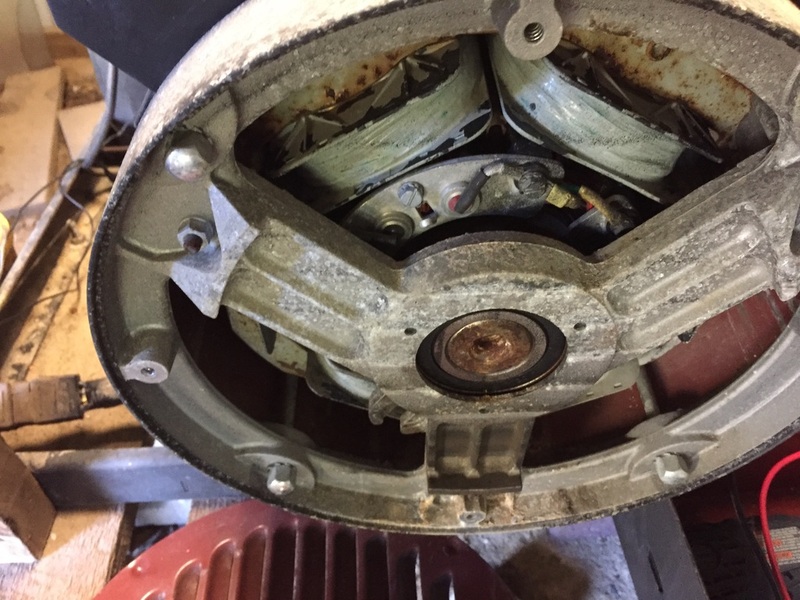 Instead to feed the rotor windings using brushes and slip rings, in the rotor shaft there is an extra rotor. This is an alternator rotor in which an AC voltage is generated and then rectified by a set of diodes, included in the rotating mass. They are known as the rotating diodes and are connected directly to the main rotor windings to induce electric power in the main stator. This auxiliary rotor receives a magnetic flux from an auxiliary stator named exciter coil, fed by the AVR.